Swan and Bottle to the Uxbridge Boat Centre. Taking it easy at Cowley. 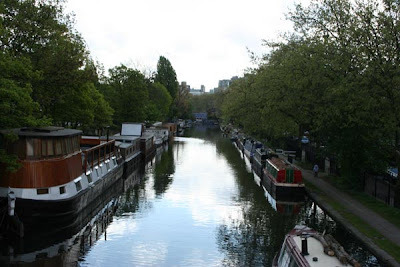 Spring Sunshine at Little Venice. 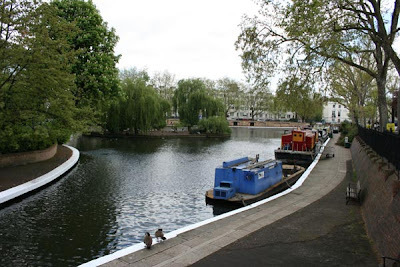 It has been a few days since I posted and that is because we have been very busy helping to set up for the Little Venice Cavalcade. 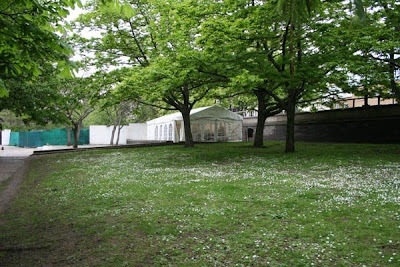 If you have ever helped to set up for any festival, fete etc you will know just how much work is involved. Tuesday some of the WRG (Waterway Recovery Group) arrived and we juggled the boats around to make sure that everyone could get on and off their boats, as we also have a couple of very elderly dogs to consider as well. Yesterday (Wednesday), it was a day of waiting for things to arrive. One of the first things we had to sort out was the setting up the camp compound. Which is where all the planning is done, as well as eating and lots of drinking of tea and coffee. Later in the day NB Belfast arrived, she is the accomodation boat for the volunteers who have offered to help out to sleep on. Keith and I have been made very welcome by Dave, Maria and the team. They depend a lot on people offering their services, whether it be for a day or for the whole event. What we are both loving about helping out, is the fact that we are meeting up with people from all walks of life and yet we feel after chatting to them, that we have known them for years. 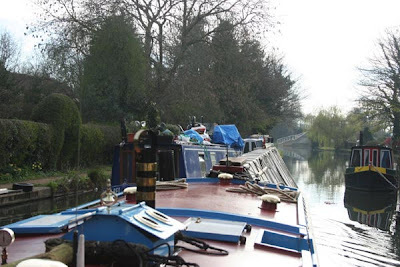 We have met one or two familiar faces, one of them being Bob on NB Glenfield, who we first met when we arrived on the Leicester Section of the Grand Union Canal over the winter, when everyone was frozen in. During the evening we were joined onboard Hadar by Tom from working boats Ara and Archimedes. Tom took over the diesel and coal business last year and has been doing a roaring trade. We spent a most enjoyable evening in his company, drinking tea and chatting about anything and everything to do with boating. This morning the Marques arrived by lorry before Keith and I were even awake. Because we could here the work going on around us, we thought we should put in an appearance, so got up, had breakfast and joined in with the work party. I unfortunately am not feeling so great today, so have not done a lot. I am hoping that this afternoon I will feel more myself, as I am not one for sitting around watching others do all the work. The Marque company were in charge of erecting the marques, so we got to watch them do their stuff. The one thing that you notice about helping out at such events, is that there can be long periods of waiting around. This is due to the fact that not all of the things needed arrive when you need them to. After the marques went up, the tables and chairs arrived, so it was all hands on deck to move them from the van to one of the marques. Some of the group have gone off to Camden to pick up a boat with further equipment onboard and that will arrive sometime this afternoon. There has not been a dull moment and everyone is getting a long really well. We are all waiting for the moment when everything happens all at once, it will then be manic. I will keep you posted on the progress made. View looking up the Terrace. View from the Maida Hill Tunnel end of the pool. View from Rembrandts Garden. Spring has sprung. From Rembrandts Garden. 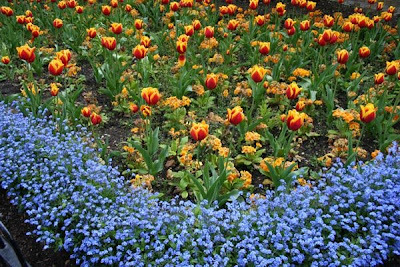 Spring glory in flower. Marmite enjoying the sunshine. 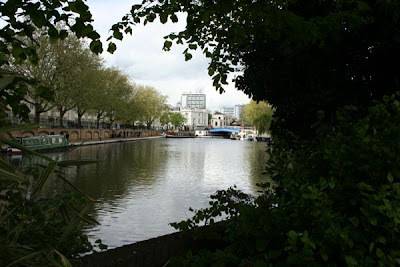 Slough Arm to Little Venice, 17.1 miles. Over the past couple of days we sat on the Slough Arm mooring, finishing off paintwork and enjoying the peace and quiet. But come mid-afternoon that peace and quiet was broken by the sound of mini motorcycles roaring up and down the towpath, with children riding them, with no helmets on. Now this subject does tend to get peoples blood boiling and that includes mine. If these children are determined to kill themselves that is up to them, but what gets my goat is the fact that they are travelling at such speed, it would be impossible for them to stop if they met an oncoming walker, cyclist or someone out with their dog or children. I see it as a fatal accident waiting to happen. Ok thats my rant over, I will leave it up to you to pass comment. The buck though always stops with the parents, who have bought these items for their children. Whilst I got busy painting the back counter, Keith finished off the Buckby Cans, which look stunning. I then set about rubbing down the front deck, hinges and locker cover, as they all needed refreshing. Ignore the feet in the photo above Lol. Having done all the paintwork, whilst we sat down to dinner last night we made the decision to move off today as another motorcycle roared past with two children onboard, one was no more than 6 years old and neither had helmets on grrrr. This morning we left the mooring, firstly heading for the sanitary station to empty the toilet cassette and the rubbish. We stopped at Bulls Bridge to go to the Tesco supermarket and were amazed to find the moorings empty. it seems that these days the moorings are patrolled by the Tesco warden and you can only stay 2 hours, which is plenty for shopping. Whilst I put away the shopping Keith, set off down the Paddington Arm of the GU. We were now heading for Greenford where we hoped we could moor for the weekend, but when we got to the Black Horse Inn moorings there was no room, so it was onward to Alperton, but we decided that we would not bother mooring there as we would be the only boat there, but carried on to Kensal Green. The prospects looked good for a mooring, but it was to shallow on the run into the 14 day moorings, and the moorings themselves were full. Not even after the moorings could we get in. This was not our day. 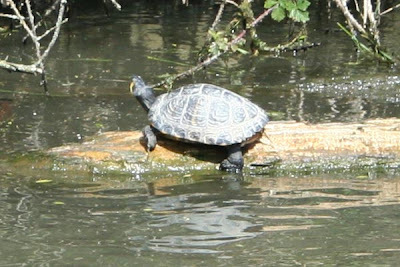 With it being such a gloriously sunny day, the Terrapins were out in force, sunbathing on logs along the canal. This made me giggle. This is taking open air living to the extreme LOL. 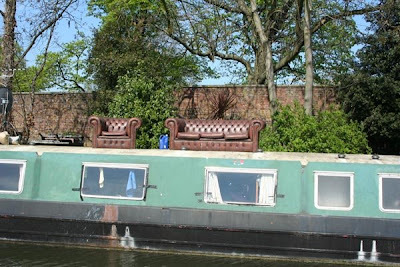 Having enjoyed a pleasant days cruising, along a beautiful stretch of the canal if you ignore the floating rubbish and the factories. We arrived at Little Venice, passing NB Gerald No13 who was moored on the Terrace moorings, with Keith and Chris onboard NB Crystal Haze and found a mooring just inside the Paddington Basin Arm, which is where we will stay, whilst we help to set up for the Little Venice Cavalcade, which we are really looking forward to. Since being here we have had a visit from Roy on NB Gerald No13 and Wide Beam Minerva has pulled in to moor up in front of us. it has been a wonderful day and we are both pleased to be back in London. Cowley to the Slough Arm Junction, 0.6 miles. Last night Keith took me out for a meal to celebrate my Birthday, we had a lovely meal at the Malt Shovel. Well worth a visit if you really cannot be bothered to cook. This morning we were woken up by the birds singing and the thump, thump of an engine as a boat passed us by. The sound of this engine is instantly recognisable as NB Gerald No 13. Roy was on his way to Little Venice. (See you there Roy). 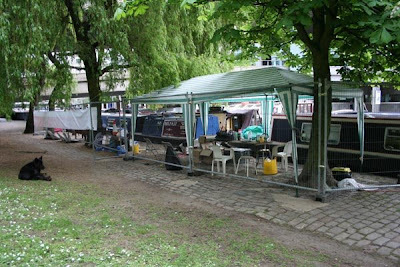 We took the decision to move to the entrance to the Slough Arm for a few days, as we want to get some more paintwork done, which we cannot do at the Cowley moorings because of the trees. Our boat was covered in tree sap which has made the roof and sides very sticky. We left the 7 day moorings at 9.30am for a 20 minute jaunt in glorious sunshine. Wouldn't it be nice of this weather lasted all Summer? 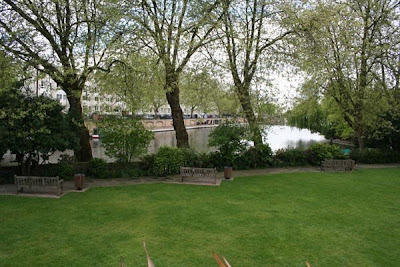 We will be staying here for a few days, before heading to Little Venice, where we will be helping to set up for the Little Venice Cavalcade at the beginning of May. Keith and I received some great news via an e-mail today. 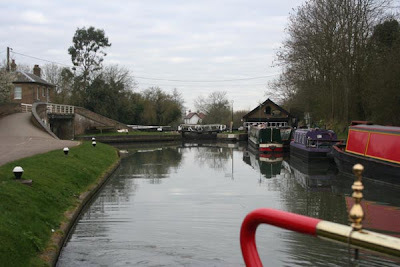 Over the winter we cruised the Leicester Section of the Grand Union Canal. We were researching the possibility of doing a winter coal run on this section of canal, which would be from Mount Sorrel to Crick including the Market Harbrough and Welford Arms. 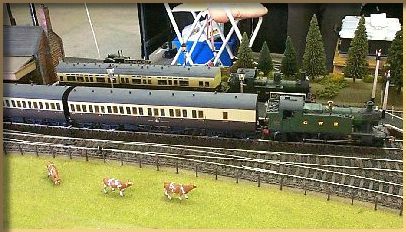 Having been asked by a few people to be the coal boat on this section, we contacted BW reagarding this. 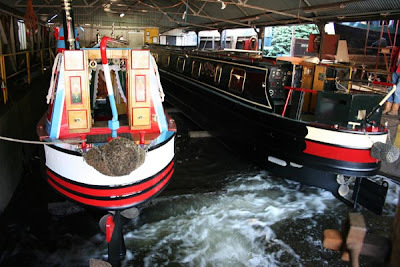 This afternoon we received an e-mail from BW who have given us permission to be the coal boat on the Leicester Section, yippee. So if your thinking of wintering on the Leicester Section and you need coal, keep us in mind. With Keith still feeling under the weather, we have been taking it easy whilst at Cowley. Keith has spent a lot of time sleeping and did not get up until lunchtime yesterday, but I have always thought that sleep is the best healer. Whilst he has been sleeping, I have been out and about chatting to other boaters. It was a pleasure to meet Duncan again on NB Zendu. The last time we met was when we had our other boat NB Misty Lady. He and his wife are still selling painted Canal Ware and jewellery. They have headed off this morning. 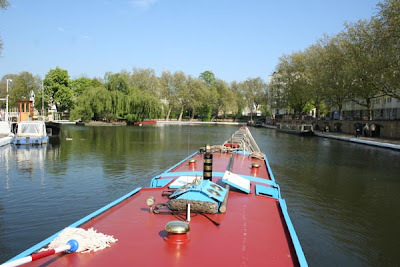 I have also met Keith from NB Crystal Haze, he and his wife Chris are heading for the Little Venice Cavalcade as well. Yesterday a couple knocked on the boat, and it turned out that the lady had been following the diary since Hadar was just a base plate. It is always lovely to meet people who read our diary, whether they are boat owners or not. This morning the Land and River Gravel Boat caught my attention, and as Roy from NB Gerald No13 and I stood chatting, we watched in amazement as this huge boat manouvered into Cowley Lock. I helped with the lock gates and found out that unladen she weighs in at 30 tonnes, but loaded she can weigh 110 tonnes, which is really impressive, but yet she is still very manoeuvrable. Her steerer was telling me that even with her size, boaters still think they can take her on, especially in bridge 'oles. Now we all know which boat will win that battle ha ha ha. Her bow has the battle scars to prove it. At Cowley Lock, there is a lovely tea room called the Toll House. You can get a fabulous Sunday roast for £5.99 if you do not fancy cooking. Over the weekend it was very busy, as was the Malt Shovel pub. Where we are moored alongside the recreation park below Cowley Lock, in the park grounds someone has carved out this really lovely working narrowboat from an old tree trunk. The park is a very busy place, with football pitches, a childrens play area, Crown Green Bowling area and plenty of places to walk. Paddy is making the most of the park. He has loved walking there and playing ball. It looks like we will be here until Wednesday, giving Keith a couple more days to get over this virus he has picked up. 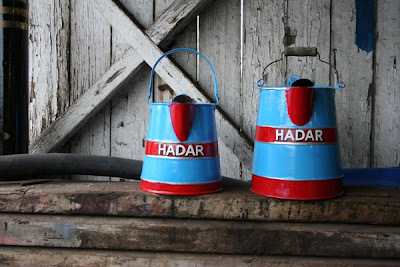 After a week of enjoyable toil and nose to the grindstone, Hadar is all ship shape and ready for the off. Our Alarm went off at 6am, and I immediately got up and had breakfast, closely followed by Keith, who had not had a good night again. I took Paddy for a walk across the park, where the sun was coming up above the town of Uxbridge. 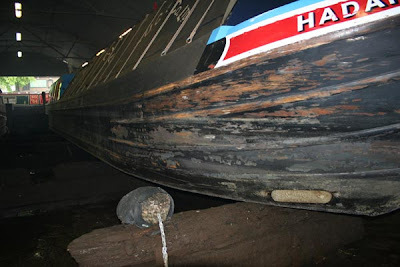 When we got back to the boat Keith and I did a few final things to prepare Hadar for leaving the dry dock, like disconnecting the landline and removing the gang planks. Chrissie and Paul did the same, we were all champing at the bit to get going. 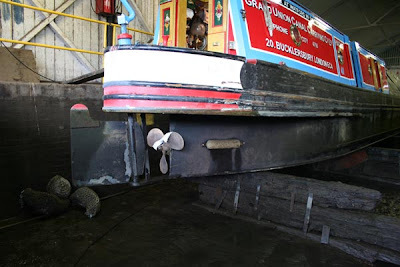 Andy arrived at 7.40am and opened the paddle, which allowed water to come flooding into the dry dock. It was no more than 20 minutes and the dock was full and both NB Anjuna and Hadar were once again afloat. We enjoyed our final conversation with Chrissie and Paul, who have been an absolute pleasure to share a dry dock with. Perhaps we should arrange to do it all over again in two years time. I reckon it worked so well, because were were like minded people. I am not sure I would want to share a dry dock with the neighbour from hell, as it is not as though you can just pull up pins and move, like on the towpath, you are stuck with them for a week. I hope that Chrissie and Paul did not think of us as the neighbours from hell, even if my singing was aweful when I had my Mp3 player going whilst polishing the boat. I have a naughty habit of singing along to the music, when I have my earplugs in. Once the dry dock was full the gates were opened and we were on the move yippee. Chrissie and Paul were the first to leave the dock on their boat NB Anjuna, which looked stunning, they were trying ever so hard not to touch the sides. We followed closely behind them, exiting out into a bright but very chilly morning. It was so nice to see proper light, after the artificial lighting we had endured for a week. 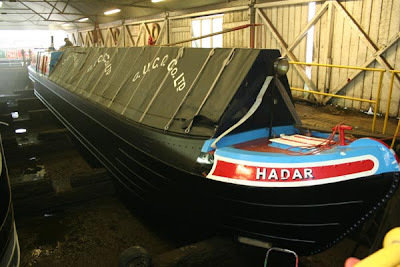 Getting Hadar out of dry dock was a little more difficult being 70ft long, because boats are moored opposite, which gives very little room for manoeuvre. It is a 24 hour mooring and yet these boats have been there for weeks and not moved on. Now why does that sound so familiar? We waved Chrissie and Paul off, as they were heading towards Denham and we were heading towards Cowley. 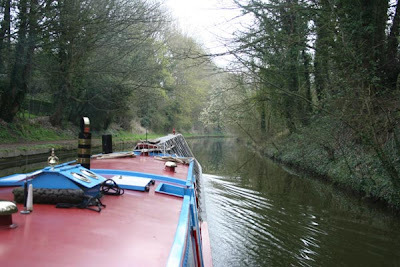 It felt lovely to be on the move again, but no sooner had we set off we were descending Cowley Lock and mooring up on what were permit holder moorings last year but have been turned over to 7 day moorings, where Roy on NB Gerald No13 was already moored up. This will be our home for a few days. Having worked really hard all week, today it was nice to relax a little knowing we only had a few things to finish off. Having walked Paddy, my first job of the day was to walk into Uxbridge to do a little shopping, nothing to exciting, but things that needed to be done, like banking and food shopping. Just the usual mundane things that we all need to do from time to time Whilst I was away Keith painted the engine exhaust lagging with white emulsion paint in the engine room to seal it all in a hard exterior to keep it neat and clean, but also to stop Marmite from using it as a clawing post. She absolutely ruined the first lagging by clawing away at it. Painting it with white emulsion paint not only stops her from damaging the lagging it also keeps it clean. On returning from my shopping trip, which I managed to do without getting lost. I set about stowing away all the paint cans we had used throughout the week, I then began wiping down the gunwales and the bow, getting rid of out muddy footprints. After some lunch Keith and I then put the bow and stern fenders back on. Hadar was now coming together. I cleaned the brass on the summer chimney and then Keith attached the brasses. It seems that it is always the little jobs that take the time. With all the jobs finally out of the way, there was nothing else for it but to have a nice hot shower. I then did the last of the washing and drying, which meant I could fill the water tank back up. Hadar was now ready for the off on Saturday morning. After dinner we spent a lovely evening at the Hillingdon Boat club in the company of Mike and Julie from NB Solveigs Song, who have a mooring on the Hillingdon Canal Club moorings. We got to know them both through the Boats and Canals Forum, and have remained friends ever since. Over a couple of drinks we got chatting about the past years adventures, and the progress of their boat. It was also a chance to talk about what we hope to achieve in this coming year. There is always so much to stay to friends and just so little time, because before we knew it, it was home time. Mike and Julie if you are reading this, thank you for a lovely evening, we look forward to doing it again sometime. 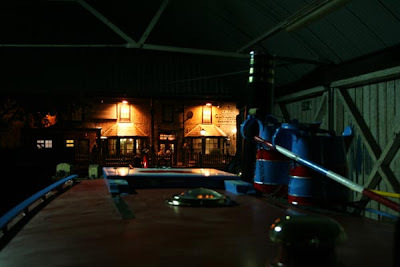 We got back on the boat and I could not help but notice the boats had move from behind us on the canal, so we had a clear view of The General Eliott pub all lit up at midnight. This morning our post arrived, thanks to Tina, who packs up our post and sends it on to us from time to time. It always feels like Christmas when the post arrives, because we never really know what to expect. 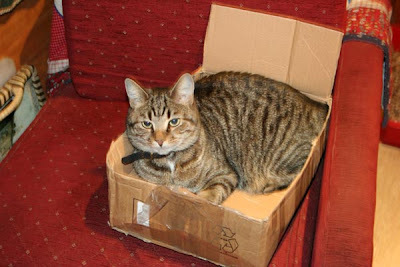 After I had unpacked the box which the post came in Marmite claimed it for her own and made herself comfortable. The past couple of days have been long days especially with Keith not feeling 100%. We continued doing the paintwork on the boat. It has been worth the long days because Hadar is now looking very splendid. Today I finished painting the stern. I then washed, T-cut and polished the cabin sides and cleaned the brass. Keith has continued to work on the two Buckby cans that we have, they are beginning to look nice now. He needs to add another coat of red and then the white bands. Keith then gave our summer chimney a coat of black gloss to refresh it a little, as it has spent the winter under the back counter. Tomorrow the brass on the chimney will be cleaned. Yesterday after walking into town and having lunch at the Tai Pan, a chinese buffet restaurant, which was scrummy, I set about washing down the inside of the back cabin, now that the stove is out. All of the ribbon plates were taken down one by one, washed, dried and put back after I had washed the walls down. 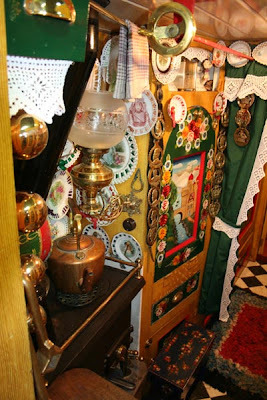 It does get very grubby over the winter, because the stove gives off a lot of dust from the fire, so it is no surprise how dirty everything was. In the photo above you can see our latest acquisition of a new ribbon plate. It is just to the right of the glass globe of the oil lamp. It is a hand painted picture of Annie Sanders by Joan Wandsworth, and very pretty it is too, and a welcome addition to our collection. The stove was given a coat of stove paint and will then be polished in a couple of days. The final job of the day was to hang the new curtains I have made. I now have a winter pair and a summer pair of curtains. Tomorrow will be a day of finishing off and then packing away the paint pots and brushes. We have had a few visitors over the past couple of days. Daisy and JohnBSA from Boat and Canals, Daisy is looking to crew a boat with someone, as she wants to learn the ropes so to speak, so if anyone wants a crew member for a few days then contact Daisy through the Boats and Canals Website. Mike from NB Solveigs-Song also paid us a visit yesterday. Today Roy from NB Gerald No13, along with his whippet Thomas arrived in Uxbridge and came to find us. 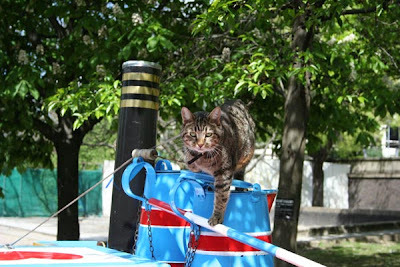 They are coming to the Little Venice Cavalcade which takes place from the 2nd-4th May. So after another long day, we are now settled down in front of the TV watching a DVD, I am quite sure we will be in bed early again. Keith and I have been extemely busy with the blacking of Hadar, despite the fact that Keith is a little poorly with a cough and throat infection. 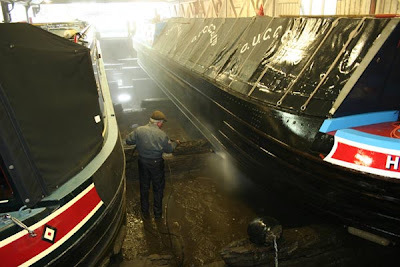 Having jet washed her on Saturday, Sunday the hard work began with the first coat of blacking on the hull. We also blacked the gunwales of the hold. Thank goodness for the invention of the roller, it is a Godsend when blacking, as well as a good brush, all of which will get binned when we have finished. It is a lot of hard work, but well worth the effort. But I would say to anyone starting out, if your not sure of what to do, then get a boatyard to do the job for you, it does cost a bit more though. 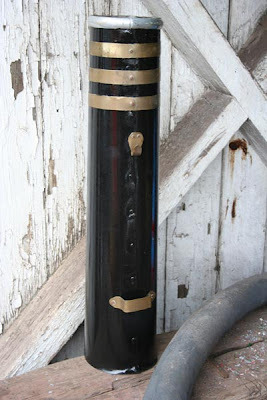 Blacking a boat yourself does keep the cost down once you know how to do it. 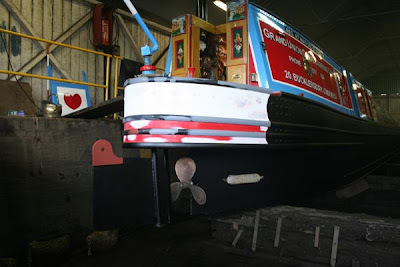 Once the first coat of blacking was done, we set about rubbing down the stern. The bow took a lot of punishment over the winter, as we were ploughing through ice which was as much as an inch and half thick. The ice took some of the blacking off which had to be patched before we completely blacked the hull. Then hey presto it was done. All shiny and new. It always looks so nice when it is freshly painted and you feel like you have really achieved something. It's a shame to put her back in the water LOL. My last job of the day was to rub down the roof, as I wanted to start on that first thing in the morning. We worked so hard that we were in bed early, but neither of us slept that great, Keith because of his cough and me, well it is my age hahahaha. 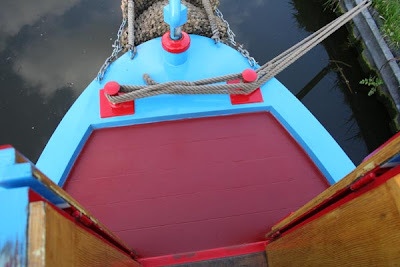 This morning the schedule was to paint the boat's roof, with red enamel paint. It looks a little like red oxide primer and is extremely good stuff. I was surprised that it did not take me long at all once I got going. 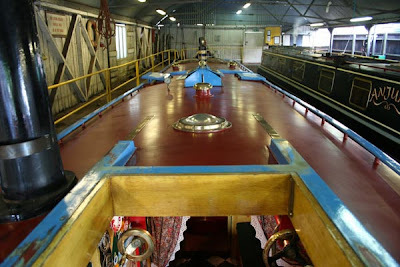 Whilst I did that Keith rubbed down the gunwales of the cabin, which are done in the same red enamel paint as the roof. Keith also rubbed down the undercoat on the stern ready for me to gloss, later in the day. In between doing these jobs, Keith touched up the sign writing on the bow and I touched up the paintwork on the engine room doors. Keith last job of the day was to rub down the Buckby can, which he has had for over 38 years and it still had its original paintwork, which was peeling off and looked very sad. Despite the fact that the Buckby can now has a few rust holes in her, we felt it was worth rubbing her down and giving her a new livery. Her first new coat of paint was some aluminium primer. My last job was to machine the curtains for the back cabin. Tomorrow we will be putting the second coat of blacking on the hull. It has been a very long day and we are both tired, so I am drawing to a close now, so good night. 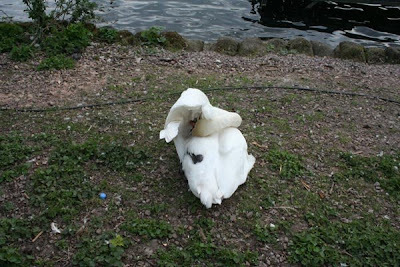 Swan and Bottle to the Uxbridge Boat Centre, 0.6 miles. Last night we were both looking forward to a good night’s kip, as we knew that today would be the beginning of a week’s hard work. So neither of us were too chuffed when we did not get a decent nights sleep. Keith did not sleep too well, just because he was thinking of what was going to happen today. I on the other hand did not sleep because of a selfish boater. Last night as always I made the back stove up, this took place at 8.30pm and as always I had the back doors open to allow the smoke to dissipate into the night air. There was not a sound from any of the three boats moored behind us. But by the time we headed off to bed, which was 10.45pm, I could hear a boat engine running, one of the three boats behind us was running its engine. To say I was miffed was an under statement, but I was hardly going to go out in my PJ’s to find the culprit, so I closed the back cabin and to be honest the engine did not sound too loud, so I thought it would not disturb our sleep too much, even though your not suppose to run your engine after 8pm, but obviously this person was extremely selfish and disrespectful. I did sleep until something jolted me into waking up. Feeling all hot and bothered I got up to get a drink and was totally incensed to still hear the boat's engine running. I got back into bed and began to wonder if perhaps something had happened to the person onboard, maybe they had fallen overboard, so could not turn their engine off, or maybe they had died onboard from carbon monoxide poisoning, as we are too well aware it does happen. No sooner had those thoughts gone through my mind the boat's engine was turned off and peace was returned to the cut. But now I was wide awake and despite trying to go back to sleep, it never really happened. So Keith and I were now both awake, and waiting for a time which it was more acceptable to get up. Just recently I have been reading other peoples blogs when they also talk about disrespectful boaters and I can now add this event to the long list of things that are really totally out of order, by people who have no respect for others. If this boater needed to run their engine at such a late hour due to boat problems, then ok fair enough, but surely they would have the decency to knock on the other boats to explain their actions. That is what we would have done. After a disrupted nights sleep, we got up and had breakfast and I walked Paddy. It was raining which made for a damp start. At 8.35am we left the Swan and Bottle mooring to head for the Boat Centre, where the dry dock was waiting for us to enter. We are sharing the dry dock with Chrissie and Paul on NB Anjuna. They are a lovely couple and we will greatly enjoy our week in dry dock with them. I am quite sure we will have a laugh whilst doing the hard work. It took sometime for the water to drain out of the dry dock, so we did not start work on the boats until after lunch time. 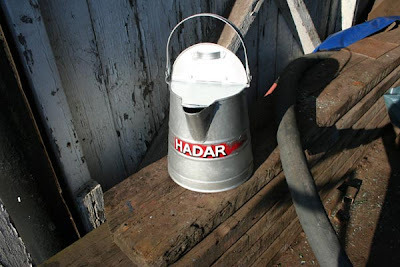 Paul suggested that because Hadar's hull was much cleaner than their boat's, that we should use the pressure washer first, which was really nice of him, because they had arrived in the dry dock first and we thought they should use it first. Keith got to work with the jet washer cleaning Hadar’s hull off. Apart from where the ice took the blacking off the bow over the winter, Hadar’s hull has faired extremely well, she was pretty clean. 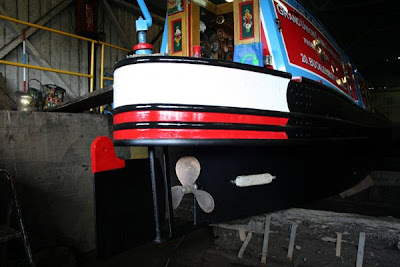 We then set about rubbing down the stern as the red, black and white needs repainting. We now have to wait for the hull to dry so that we can start blacking tomorrow all being well. I will post more photographs as we progress. Harefield to Uxbridge, 4.1 miles and 4 locks. 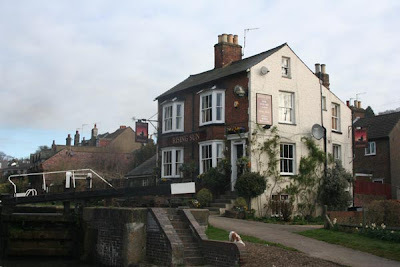 After a couple of nice days in Harefield, we were going to head off, destination 'The Swan and Bottle' moorings in Uxbridge. It was not a particularly nice day, no sooner I opened the back cabin doors, Paddy and I were met with drizzly rain. Paddy therefore made his walk a quick one, he then did an about turn and legged it back to the boat, where he knew his breakfast biscuits would be waiting. At 9.25am we let go, it was now drizzling quite hard as we approached Black Jacks Lock, where a family of Australian's were watching our every move. The lock was full and a boater waiting to come up opened the gate for us, this was much appreciated. We were lucky all the way down as the locks were either with us or someone was coming out of the lock, leaving the gate open for us. We arrived at 'The Swan and Bottle' mooring, where there was room for us to slide into. Before taking off our coats and wet gear, we walked down to the Uxbridge Boat Centre, to let them know that we had arrived, as we are due to go into dry dock at 9am tomorrow morning. 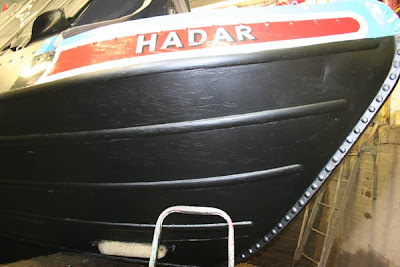 For the next week we will be hard at work blacking Hadar's bottom and doing some paintwork jobs, so we may not be able to get online. So think of us up to our armpits in bitumen, whilst you are enjoying your Easter Eggs LOL. Have a wonderful Easter break whatever you are doing. I will take pictures and post if I can. These days there are so many ways to keep in touch with friends and family over the internet. Keith and I are now using another site for keeping in touch with friends and family. You can find us on Face Book now as well. So if your a Face Book user come and say hello. You can contact me on my e-mail address jo_lodge@hotmail.com and I will be happy to add you. Rickmansworth to Harefield, 2.8 miles and 3 locks. We spent a lovely few days at Rickmansworth. On Saturday we walked around the town and I popped into Iceland for some cooked chicken pieces, and as always ended up buying a few other bits for the freezer, which included some ice cream Magnums mmmmm. Sunday we took a walk around the aquadrome as it was such fantastic weather. It seemed like the whole world and his wife had come out to play. It was lovely to see whole families out having a picnic, play ball with the kids, children riding their bikes, everyone having a throughly good time. We took the opportunity to sit and watch a model boat club having a race day with another club. They were sailing model yachts around a course and were taking it all very seriously. They even had some races with prizes. Guess the prize????? The prize was an Easter Egg LOL. Monday we did a few boat jobs, which included tidying the hold and making a shelf for under the cratch. There is a Travis Perkins close by so Keith nipped in there in the morning and bought some wood and we set about constructing a shelf. It looks and works brilliantly, after working so hard, we thought we deserved lunch in town at the Chinese Buffet, which we have eaten at before. All you can eat for £5. A real must if your in Rickmansworth and you like Chinese food. 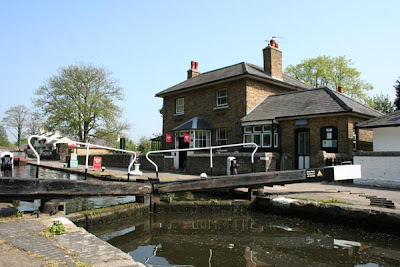 We also popped into the Canal Centre by Batchworth Lock, as they have some of my poetry books for sale and I wanted to see if they needed topping up. I managed to sell a book whilst we were chatting, and was more than happy to sign the copy for him. 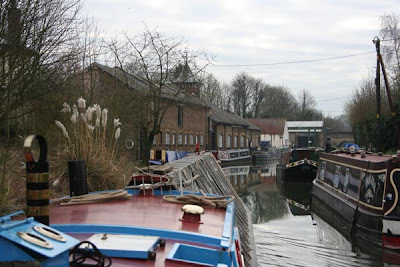 Tuesday saw us leave our mooring and head over to the Tesco mooring, where we would leave the boat whilst we did a food shop in the Supermarket. There are a couple of large signs on the moorings which state quite clearly that the moorings are for Tesco only and that there is STRICTLY NO OVER NIGHT MOORING. Clearly one private boat owner could not read, even though he was mooring right by the sign. He had been moored on the moorings for two nights. Anyway we did our food shop and left the mooring, destination Harefield. We had a pleasant cruise on such a fabulous morning. 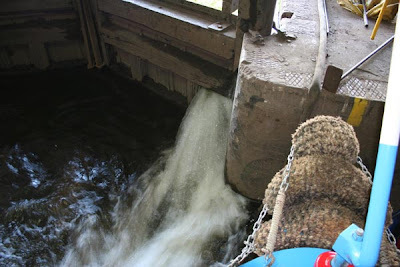 The fun and games began as we cleared Spring Well Lock. Just below the lock we saw a boat just about it seemed to pull away from the bank, so we slowed down to allow the boater to set off, but he was in fact trying to get his boat on to the moorings on the Spring Well Farm moorings. There he was pushing his tiller arm from side to side, with absolutely no effect. There seemed to be no guts in his engine. Keith reckoned he did not even have it in gear. Anyway we watched as he poked his bow into the mooring on the opposite bank, this was acheived by the wind and not by his own actions. He then put his hands to his head in dismay, as he had no clue what to do next. He leapt up on to the boats roof, grabbed the centre line and left the boat at the bow, hoping to pull the boat round. Oh now that was never going to work, because the boat was now wedged across the canal. The boater climbed back onto the boat, ran along the roof and jumped down on to the counter, his dog has now had enough and has abandoned ship at the stern and is standing on the towpath, wondering what on earth his owner is doing. We were wondering the same thing. He tried to push the stern away from the bank, but had little effect, so he then got his pole and tried to push his way over to the mooring, but it was clear he had no idea of what to do next. Watching him it was clear he was almost at the point where he was about to jump up and down on the spot, screaming like a banshe. I reckon he was now desperate for some help, which came in the form of another boater on the Spring Well Farm moorings, he came to his rescue with a tug, which he used to push the boat back on to the towpath side to allow us to pass. I said thank you, to the tug driver, to which the man on the striken boat shouted "I am sorry". It gave us 15 minutes of pure entertainment. I so wish I had the video camera to hand, because it would have been sent to "You've Been Framed". So with that over and done with we descended down through Coppermill Lock, passing Pisces the working boat Keith worked on when he was 15 years old and found a mooring past the Coy Carp Pub. After some lunch we walked up to Keith's sister and brother-in-law, where we enjoyed a nice few hours, drinking coffee and catching up on all the family news. Today (Wednesday), we have walked along Troy Cut, which is privately owned now. 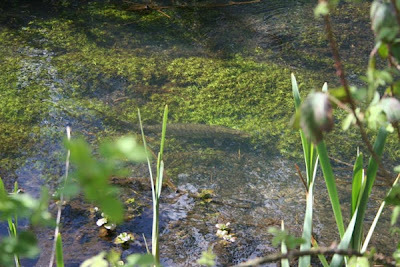 In the clear crisp water we spotted three pike lurking, just waiting for dinner to swim past. The walk takes you around a huge lake, which looked magnificent with the sun shining on the water. At the end of Troy Cut we caught a glimpse of an old working boat with the Ovaltine Logo on the cratch. 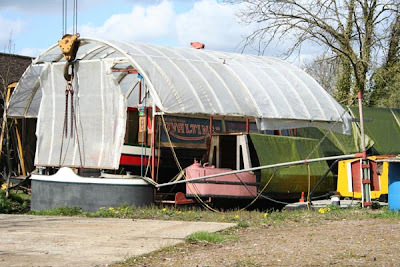 On closer inspection it is being restored by the Troy Wharf Trust, where they restore old working boats. 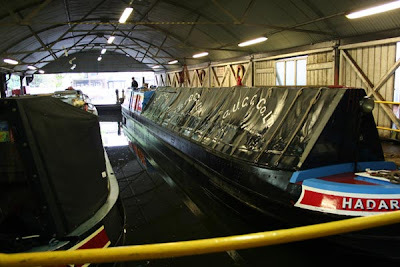 We could not see a name, but it was lovely to see one of the old Ricky boats being brought back to life. There were a couple of old wooden boats, which were now left to mother nature, which is very sad. 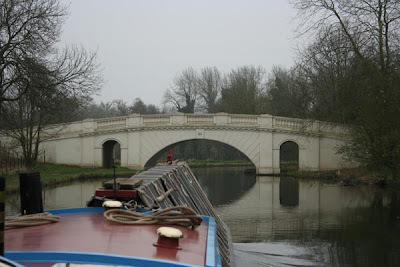 Hunton Bridge to Rickmansworth, 5.2 miles and 10 locks. I had a particularly restless night, and remember the church bell chiming at 1am, 3 am and 6am, there was definitely a pattern developing I reckon. When we did get up, all the usual morning jobs got done before we let go at 9.20am. I walked down to the first lock of the day, which is part of the Hunton Bridge Pair. 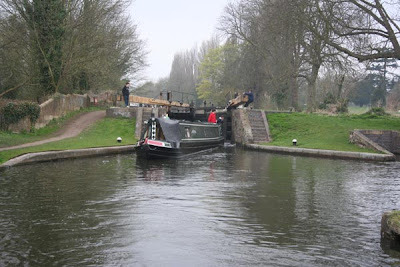 As we approached Lady Capel’s Lock, we noticed a boat winding below the lock and thought our luck may be in, as far as someone to share the journey with, but it later became apparent that this boat was already sharing with another boat. After descending Lady Capel’s lock we were into Grove Park the home of the Earl of Essex. 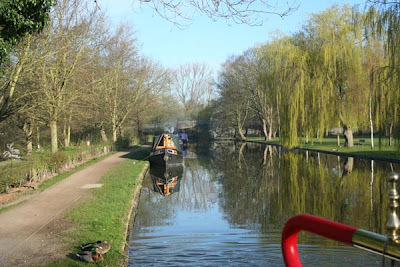 The canal then winds its way through beautiful Cassiobury Park, which at any time of the year looks stunning. 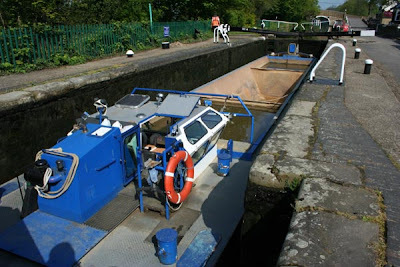 We arrived at each lock just as the pair of boats was leaving it and I would shut the gates for them. We spent a nice few hours cruising alongside the River Gade. What is noticeable is the lack of visitor moorings. Keith remembers when there were a lot of visitor moorings along this stretch, these days they have been turned into Permit holder moorings for residential boats. Leaving very few places for moving boats to moor up for the night. Our last lock of the day was Batchworth Lock, once we had descended down through the lock; we squeezed ourselves into a mooring opposite Tesco. It is incredibly busy with all moorings taken. 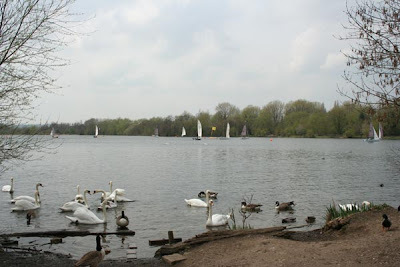 We are now going to spend a few days here, enjoying the Aquadrome and Rickmansworth. 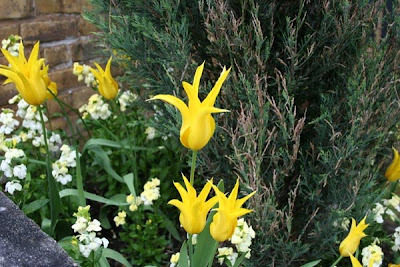 Because we cruise all year round we get to look at some fantastic gardens, but we also see some shoddy garden, who go into the could try harder file. 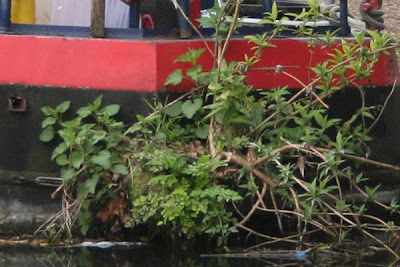 Today I spotted this garden on a boat fender. They have a flourishing Buddleia, Nettles and other foliage growing out of their rear fender. A definite could try harder. Winkwell to Hunton Bridge, 5.7 miles, 12 locks and 1 swing bridge. Our mooring began early again. The Canada Geese were honking loudly, which started a flurry of birdsong and then Marmite decided that it was about time we woke up. At 9.10am we left the Winkwell overnight mooring. I walked up to the Three Horseshoes Inn swing bridge to open it. To operate ithe bridge you need a British Waterways Key, you then press a couple of buttons and the work is done for you. Being around the time of the rush hour though, when the barriers came down it was not long before there were queues of traffic both sides of the bridge. But I had the key and the power over the gas guzzlers, and they could go no where until Hadar had gone through and I had shut the swing bridge and allowed the barriers to rise up. We cleared Winkwell and Boxmoor Locks and were operating Fishery’s Lock, when a lad on a bike joined us. He was on lock wheeling duty for NB Marshalls, which was just entering Boxmoor Lock above us. So we said we would wait for them at Frogmore End Lock. What followed made our days cruising extremely pleasurable. It was all down to the company that joined us. 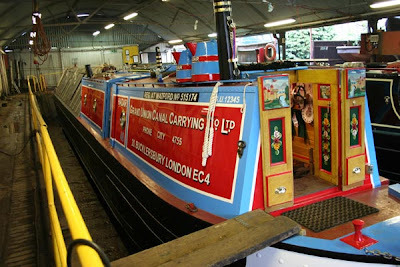 NB Marshalls had a crew of five onboard, they were John and his four grandsons, who were hoping to make Limehouse Basin for Saturday, because they had a party to go to. It was going to be the 30th Birthday of John’s business and a party was organised for him, his family and the staff. So John and his grandson’s had been doing long days, in order to make it on time taking the scenic route. 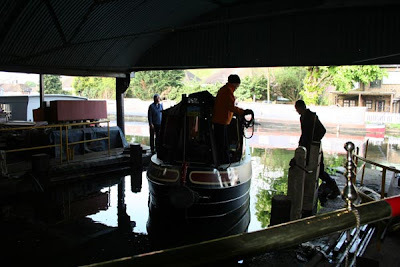 At times I felt like I was abandoning my job doing the locks, but John’s grandson’s had everything under control and kept telling me to get on the boat as they were ok doing the locks. I did from time to time, manage to shut gates or open paddles, when they were not looking LOL. I am not one to argue with strapping lads, who are able and willing to work hard. As we left each lock, one of them would jump on the bike and cycle to the next lock to get it ready for us both to enter. It worked like clockwork and good progress was being made. 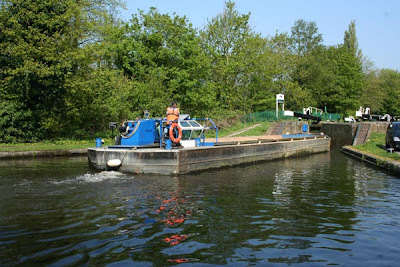 At Apsley Locks, we had to empty the toilet cassette and John left the boys to move the boat whilst he went to the supermarket to get eggs and bacon for their breakfast, he would catch up with us at Nash Mills Locks. The cruise past Hemel Hempstead is really not to bad, as it is not really that built up. On the approach to Nash Mills Locks, we could see a boat getting ready to move off, so we let the gentleman know we were travelling with another boat down as far as Hunton Bridge, he nodded his acknowledgement, so we thought he would wait for NB Marshalls to pass him, as they were right behind us, but oh no he just pulled out right in front of them, meaning they had to go into reverse to avoid hitting him. As we got to the lock, I stepped off the boat to open the gates and this man thought it was his opportunity to sneak his boat in ahead of NB Marshalls, but Keith saw what was coming, so he sat in the lock entrance, thus holding him back. John arrived back from his shopping trip and I explained to him what had happened. John asked the man what he was doing and told him that we were travelling together, and that you do not just pull straight out in front of another boat. It was at this point the man seemed to behave like he was either not listening or did not understand the error of his ways; he said he was trying to reverse his boat, which was absolute rubbish. It was a little tense for a few moments, but having waited for this man to move his boat we then preceded down the pair of locks and left him behind. The canal follows the railway almost continually, and there are some very pleasant stretches in between the locks. At Home Park Lock there is a lake which hugs the side of the canal. 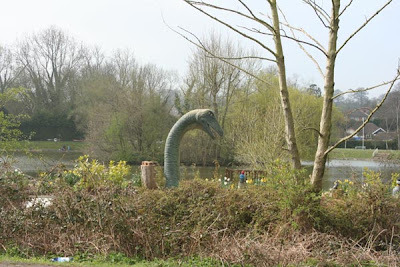 It has its very own Nessie. The peace of the canal was then broken by the roar of the M25 overhead. Our last lock of the day was North Grove Lock, which was where we said cheerio to John and his crew. We really enjoyed our time with them and so thanked them for all their help, chatter and laughter. It was a pleasure to share the cruise with such good company and the weather was kind to us. After a chilly dull start to the day, the sun was now shining as we pulled into Hunton Bridge. The only drawback is the mooring is a little shallow, so we are not moored close to the bank. Paddy will have to make a leap of faith when it comes time for him to go for his evening walk. As the afternoon wore on, I went stick collecting for the back stove in the copse by the boat. There was plenty of dry wood available to be broken up and I managed to fill two carrier bags. As the afternoon has worn on, it has become chilly so we have now closed the boat up for the day. Labels: Hunton Bridge, NB Marshalls, Winkwell. Bulbourne to Berkhampsted, 5.3 miles and 7 locks. We were awake early, having been woken up by Marmite. Firstly she stood on Keith and began kneading his chest with her paws, when that failed she dug her claws in, which had the desired affect, Keith was now awake. Marmite then turned her attention to me. She wound herself around the top of my head, purring very loudly. So now we were both awake, there was nothing for it but to get up. Once I was dressed, Paddy and I stepped off the boat for his morning walk down the locks, where we met Norman who was letting some water down to top-up low pounds; Norman has worked for British Waterways since 1968. We had a lovely conversation about how he still enjoys his job. He told me he began working for BW in 1968 at the Marsworth Yard, where he started off making concrete piling and got to know all the old boatmen and woman over the years. It was really nice to meet such an interesting gentleman. Norman had work to do and Paddy was getting a little impatient for the rest of his walk, so we said our goodbyes and we were both on our way. Back onboard Keith was readying Hadar for the day’s cruise, which would be very enjoyable. We left the mooring and cruised past the old BW Bulbourne Workshops, which are really beautiful. No sooner had we set off we were enveloped by trees on both sides of the cut on the Tring Summit Level, giving a feeling of seclusion. Cowroast Lock announces the end of the summit, it is then down hill from there on. One of the pretty lock cottages is up for sale, like so many of the systems lock cottages they are sold to private owners, as lock keepers are no longer needed in many areas. 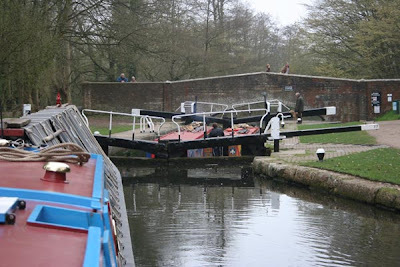 We took on water above Cowroast Lock before we began the drop down to Berkhampsted where the scenery changes, with the area becoming much more built up, with parkland thrown in for good measure. As we got closer to Berkhampsted, the paddle gear is locked with padlocks, so you have to carry a BW key to open them. It is to stop the little darlings opening the paddles and emptying the pounds. 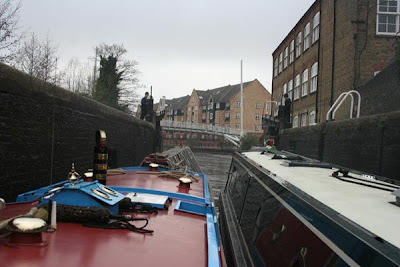 We decided to moor below the pair of Gas Locks, which is close to Waitrose and the town centre. After mushrooms on toast for lunch, we strolled into Berkhampstead, which has buildings from all periods; it is a pretty little place, which was being bombarded by the sound of police sirens. Two then four police cars came past us at speed, with the blue lights flashing and their sirens blaring. Two minutes later they came back past us, but this time they were in hot pursuit of a red saloon car. Despite they had their sirens and lights on; other drivers were in no hurry to get out of their way. We did wonder later if they got their man. On the high street the Church of St. Peter stands very tall and proud. 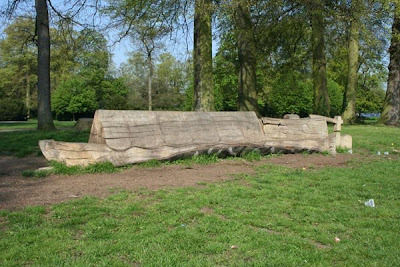 Berkhampsted has the remains of a Norman castle, where William the first received the offer of the English crown in 1066. It has been another lovely day, but then for us everyday is a lovely day. Berkhampsted to Winkwell, 2.6 miles 8 locks. After a quiet evening onboard and a lovely nights sleep, we were awake early listening to the bird song and the trains. Sunshine was pouring through the pigeon box portholes, announcing the perfect start to April. Maybe this is showing us what is to come for the rest of the year ha ha ha (A girl can dream). Having got up, I opened the back cabin doors to the world, and was greeted by warm sunshine. This was going to be a great day. For cruising, so we headed off at 8.20am. 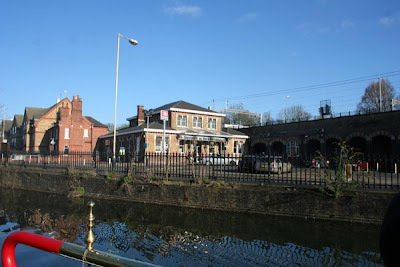 Having descended down through Berkhampsted Lock, we passed Berkhampsted Railway Station, where people were setting off to work. 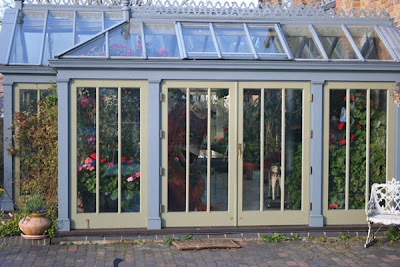 At Castle Wharf, which was the home of Bridgewater Boats, Keith took this great photo of a large ape in a Conservatory. After Ravens Lane Lock, we were descending down through the Rising Sun Lock, with its very pretty pub named funny enough The Rising Sun, which Keith remembers from his days working on Pisces. We were heading towards Top Side Lock, when we came across this boat heading straight for us. Spot the steerer. There was absolutely no way the man onboard could see where he was going, over the mountain of stuff on his roof, not only that he had no licence. He did hit us but it was never going to affect Hadar much, she just pushed him aside. 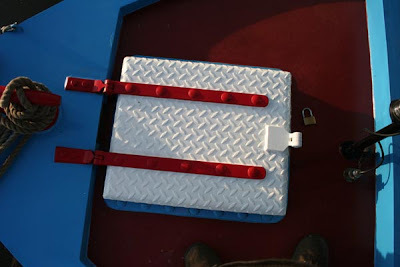 On arriving at Top Side Lock, a British Waterways Patrol Officer greeted me with a good morning. I asked if he was out checking boat licences, he told me that he was looking for two Section 8 boats which he had notices for, but it seemed they had done a runner. But he said he was in no doubt that he would find them. I spoke to him about the boat with its crowded roof and he said that they were aware of the boat and had, had words about that and the fact that he had no licence. So I left it in his hands. 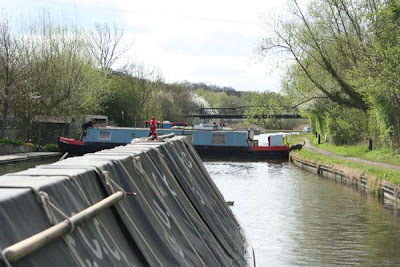 We were now cruising back out into the countryside and it seemed to be a day for meeting British Waterways staff, because on our approach to Sewer Lock, we saw the British Waterways boat Cassio in the lock, ready to exit the lock so we moved into the lock alongside her. The two gentlemen were busy at work with a grinder, cutting off an unwanted bolt. We spent a few minutes chatting to them, and then NB Blewit arrived below the lock waiting to come up, so we said our goodbyes to the BW men. I passed the time of day with NB Blewits owner, talking mostly about the beautiful weather we were now enjoying and hoping that it would continue. They were in no hurry to be anywhere as they have been pottering up and down this part of the canal for some 20 years. We on the other hand were heading for Winkwell, two locks further down. At 11.10am we moored up below Winkwell Locks near The Three Horseshoes Inn. Keith and I were both of the opinion that we would have lunch at the pub for a change. The last time we were down this way, we did not get the chance to go into the pub. The Three Horseshoes dates from 1535; it has an exquisite stone set and tile floor as you walk into the bar. It is said that the pub has two ghosts, a highwayman and an old lady; they are to be found in the Tackbar. At just after 12 noon we walked down to the pub, and ordered a couple of pints, along with a King Prawn Thai Curry each. Both the food and the drinks were excellent as was the service. We would both recommend it as a place to stop at for a meal. After eating our lunch we then sat outside by the canal and finished our drinks. Back onboard, it was time once again to clean the boats brass. At this time of year, when it is dry we like to clean it every couple of days, to keep it gleaming. I then gave the boat mats a good old brushing, and the floors a brush to get rid of Paddy’s hair. He seems to moult all year round, so I am constantly sweeping up after him. Both Marmite and Paddy spent the afternoon on the stern of the boat watching the world and the general public go by. Not sure where we are off to tomorrow. But we are both looking forward to another days cruising in this lovely weather and it means we are getting closer to our first set destination for this year, Uxbridge.